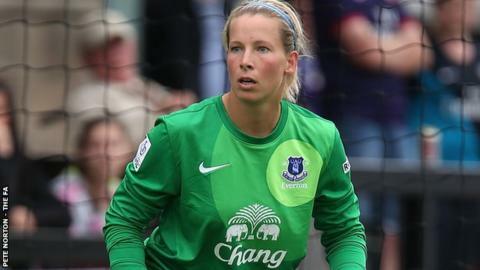 Everton goalkeeper Rachel Brown-Finnis has been recalled to the England squad for the World Cup qualifier against Ukraine on 8 May. The Lionesses take on Ukraine at Shrewsbury Town in what could be the toughest match of their campaign. England, who beat Montenegro 9-0 earlier this month, face a Ukraine side ranked 16 places below them. Brown-Finnis, who replaces Bristol's Mary Earps, said: "We both have unbeaten records we want to protect." England, managed by head coach Mark Sampson, have made a 100% start on their road to Canada in 2015, winning five games and scoring 29 goals without reply. But Ukraine are the second highest-ranked team in their group and drew 1-1 with Wales earlier in April. Brown-Finnis, who returns after injury, added: "I am genuinely thrilled to be back in the squad. After the results we've had, there's not been any real reason to change goalkeepers so I'm so pleased to be given the chance to show the new team what I can do. "Ukraine will be a tougher game for us - they also have an eye on qualification. "We'll go into the game full of confidence though after some great wins and I know we have the talent and ability in the squad to go out there and get all three points."